Kinect is not like Apple’s Siri, in that it can’t understand natural phrases. You can’t, for instance, say “show me a list of action movies.” Instead, you must say “Xbox, Bing, Action.” and then filter out other types of content. But Microsoft does a good job of guiding the user along. If Kinect is plugged in, you’ll see a little prompt to say “Xbox.” It’s the magic word, showing a list of voice commands and highlighting how to select the content that’s on the screen. You don’t need to pause after saying “Xbox,” but when you do, the dashboard spells out your options so you don’t have to memorize syntax. The new dashboard itself lends a hand here. Microsoft has thrown out confusing categories such as “My Xbox” and “Community,” replacing them with straightforward sections for Bing, Home, Social, Video, Games, Music, Apps and Settings. Using Kinect, you can say “Xbox (Category)” to jump to the relevant menu. Also, motion controls are speedier now. You still glide through menus by moving your hand to one side of the screen and then swiping across, but the area of detection is much larger, to the point that I could navigate from one panel to the next with my eyes closed. 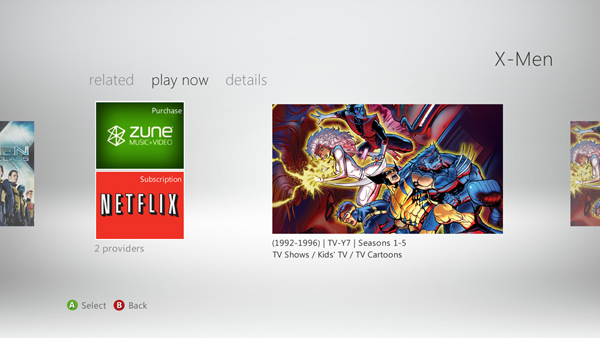 Netflix and Hulu both received major updates with expanded Kinect support. Before, the Kinect versions of these apps only showed a small selection of content, so if you wanted to view the full catalog, you had to use a controller. Now, both apps have a lot more categories to choose from. On the downside, you can’t search by voice within Netflix or Hulu, but you can find their content through Bing search on the main dashboard. Because Kinect works so well throughout the Xbox 360, it’s all the more jarring in the handful of apps and instances where you can’t use voice and motion controls. You’ll need a controller to send messages to Xbox Live friends, adjust system settings and agree to new terms of service, and you can’t use voice or motion to exit a game. Some apps, including Facebook and Twitter, haven’t been updated, so they lack Kinect controls and look outdated compared to the new Metro-style interface. But for the main purposes of moving around the dashboard and watching TV, Kinect is now what it always should have been–an excellent tool for controlling the console when other controllers are out of reach.